TOKYO--(BUSINESS WIRE)--NTT Communications Corporation (NTT Com), the information and communications technology (ICT) solutions business within the NTT Group (TOKYO: 9432) announced today that it earned the ‘valued partner’ accolade in 5 out of 12 categories according to the second edition of Digital Zenith Benchmark, a report recently published by Ocean82 that measures customer-centric evolution. A total of 866 people, who work for large and multi-national enterprises, were interviewed about their experiences with global service providers, generating about 1,000 evaluations and 6,000 points of data, over the last 12 months. The data was analyzed using an algorithm to calculate a cooperation coefficient, which is denoted by DZ and named DIZEME. The ‘valued partner’ benchmark represents the point at which the level of cooperation between supplier and customer takes root and flourishes. It has a value of 100. Scores above the benchmark illustrate the gradation of firm customer loyalty (advocates and valued partners) and those below the benchmark illustrate the gradation of a fragile or deteriorating customer loyalty (habitual or convenience purchases). To obtain a ‘valued partner’ rating a service provider must exceed the ‘valued partner’ benchmark. This is achieved through a company-wide commitment to providing an outstanding customer experience. It requires that service providers demonstrate exceptional customer satisfaction to earn the firm loyalty of their customers. 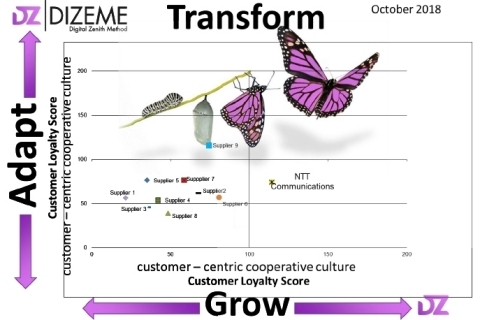 NTT Com is rated as a valued partner, for a high level of customer engagement, at the time of innovation, purchase consideration, first purchase, service selection and growth from transformation. According to Janet Watkin, Managing Director at Ocean82, “transformation in the digital age requires that global service providers earn and sustain the trust of their customers to become valued partners. The emotion is the force for growth and user sentiment is often revealed at those times during the purchase cycle that most impacts growth”.